With the consumer shift from viewing TV over multichannel subscription video services to watching Internet video via a broadband or WiFi connection, as well as the growing popularity of watching video across a wide range of devices, today’s households are taxing metro residential backhaul networks like never before. This was the focus of Ciena®-sponsored research conducted by ACG Research. The study, “Forecast of Residential Fixed Broadband and Subscription Video Requirements,” found that average household bandwidth requirements are poised to increase by 31 percent annually over the next five years—from a peak hour average usage per household of 2.9 Mbps in 2014 to 7.3 Mbps in 2018. The study provides network planners information to help them precisely model the impact of residential households’ increasing use of broadband and subscription video services across varied devices on specific network scenarios. It also reveals data about the transition from broadcast service, which is multicast across the metro network, to streaming video service, which is unicast and distributed to multiple devices in each home, and the impact that shift is having on today’s residential backhaul network. According to Ciena, service providers can address this demand by offloading streaming video traffic to a high performance packet-optical network by leveraging newly released technologies such as the hybrid OTN/packet central switching capability on Ciena’s 6500 Packet-Optical Platform or the dense 10GE handling capabilities of Ciena’s 8700 Packetwave Platform to reduce network complexity and total cost of ownership by up to 50 percent. OTT unicast video traffic is predicted to be 4.6 times greater than traditional multicast traffic by 2018, according to the study. The shift from viewing TV over multichannel video subscription services to Internet video is a fundamental driver and accounts for the majority of the bandwidth requirement for all device types. Usage of Internet video, which includes smart TVs, is expected to grow from 12% of overall peak average bandwidth in 2014 to 25% in 2018, a compound annual growth rate (CAGR) of 56%. The use of Internet video represents the largest contributor to household bandwidth consumption by 2018. 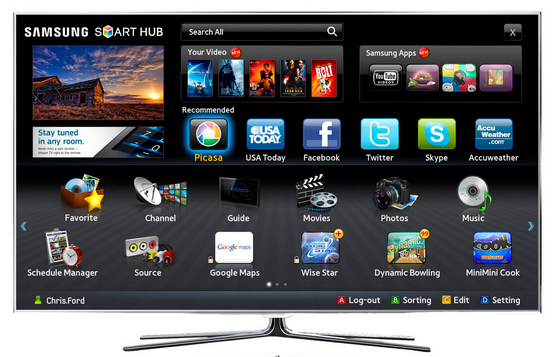 Other factors driving increasing bandwidth requirements include the trend toward multiple Internet-enabled devices in a household consuming content simultaneously; the use of Internet streaming consoles, WiFi- enabled tablets and smartphones, which have the highest device concurrency; the growing adoption of large screen TVs and increased penetration of HDTV; and the emergence of ultra-high definition 4K TV. The research found that use of 4K streaming video services—which consume three to four times more bandwidth than HDTV—will grow from 2% in 2014 to 12% in 2018. 4K infrastructure is currently deployed in many studios, as is 4K projection equipment in tens of thousands of cinemas worldwide. This provides the basis for rapid consumer uptake of 4K TV sets once consumer electronics companies can reduce the cost. Consequently, 4K TV is likely to become a mainstream offering within five years.